You probably already saw on the Facebook page, but I'm giving away the official tour shirts to TWO lucky and deserving fans! To enter, all you have to do is Like, Share, & Comment why you deserve. One week left! HERE. And no, I'm not being endorsed or paid to do this, it's my gift to the Toronto fan Angels. Being a K-pop enthusiast myself, I was moved by how much effort and dedication you folks put into making this concert happen. You are probably poor and broke just like me. This is legit the first large K-pop concert in CANADA.. This is big! And of course, a big shoutout to Krowdpop for hosting this and making the k-pop dream come true. Crowdfunding is can be powerful. I am inspired when I see large groups of people working together to achieve a dream- You guys deserve it. 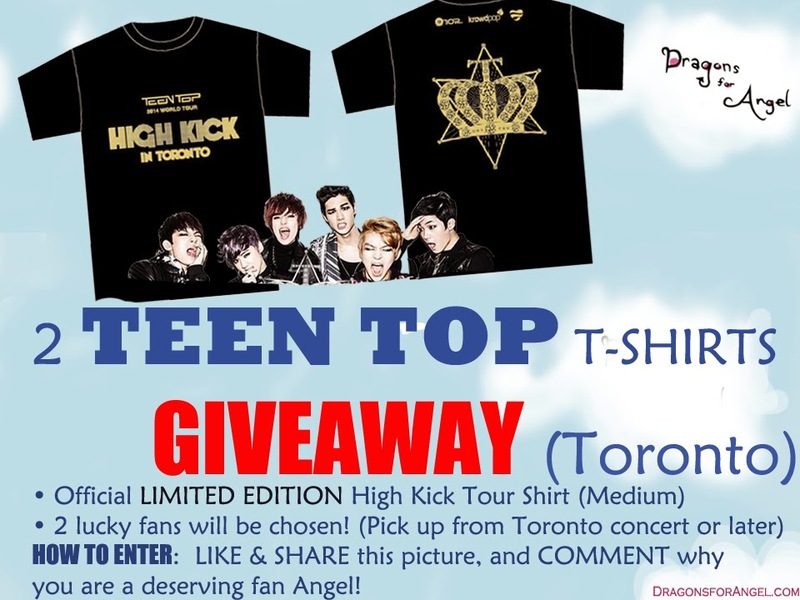 I wish I could buy 100 merchandise items for Toronto, but alas.. Two for now :) I will continue to support Krowdpop and more K-pop concerts in the future, so keep an eye out for more giveaways! I will be going to the concert myself in 2 weeks ($80 ticket), so hopefully I will see you there!